The glass melting process in a furnace is based on the energy transfer between the flames generated by the fuel oxidation and the glass bath. This energy transfer takes place at high temperature in the combustion chamber of the furnace. The main player in the process is the combustion system and the burners integrated with it, which manages the optimal mixing of the air and of the fuel thus ensuring that the heat exchange takes place with efficiency and under the most stable and safe conditions. FALORNI TECH designs its combustion systems tailored to furnaces specifications, depending on the kind of glass and using updated engineering criteria and constantly researching innovation and efficiency of its systems. The combustion systems for our furnaces are manufactured in full compliance to the international safety standards in force (EN, ATEX, etc.) and using only components of primary suppliers assembled in skids fully piped up and wired, ready to field connection. 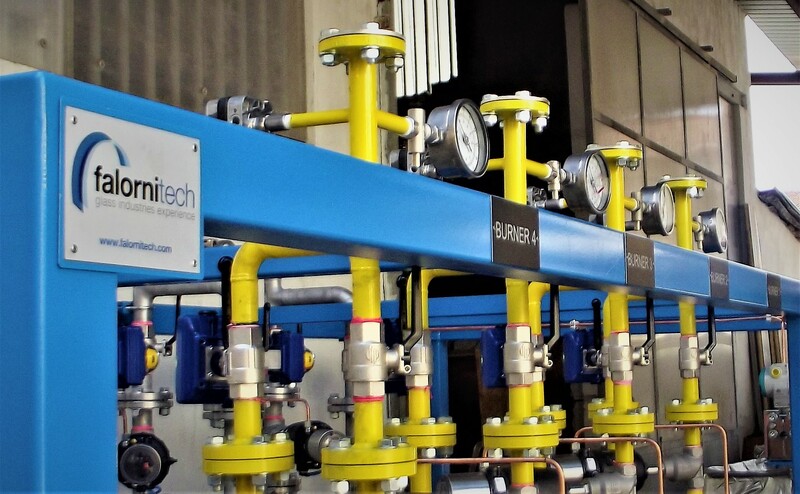 All piping in carbon and stainless steel are realized by certified welders and all skids before delivery on customer’s site, the systems are cold tested, pressure tested and validated by our engineers which release the conformity certificate.